Do you ever get that weird feeling that someone is watching you? It is probably your nosey neighbor spying on your family and friends. Why can’t they just mind their own business? Something has to be done. If only there was a way to make your backyard more private…A Privacy Fence! Installing a privacy fence is a great way to add privacy to your yard (keeping your nosey neighbor at bay), while also adding to your home’s curb appeal, value, and so much more. First and foremost, a privacy fence will help make your yard more private. A beautiful wood or vinyl will greatly add to the curb appeal of your home. A privacy fence will add to your home value. With holiday crime rates on the rise, a privacy fence can add much needed security and protection. 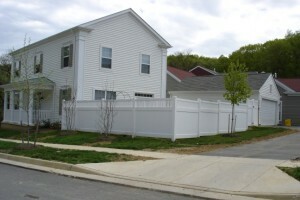 Privacy fences, because of their height, help with noise reduction. These fences are low maintenance. Even wood privacy fences require very little maintenance. Wood fencing provides a natural and rustic look to complement any home, while vinyl privacy fences provide a modern twist to an old favorite. You can’t go wrong with either option. At Hercules Fence of Newport News, VA, we pride ourselves in our wide variety of wood and vinyl privacy fences. Our sales team can offer you many options to choose from to accommodate your privacy, semi-privacy, and decorative needs. With over 50 years in the fence business, we are well aware that our reputation must be earned anew every day. If you have any questions about Installing a Privacy Fence in Northern Virginia, please contact Hercules Fence by calling (757) 316-3600 or visit FencesNewportNews.com today! You can also follow Hercules Fence on Facebook, Twitter, Google+ and YouTube while you are at it. This entry was posted on Tuesday, December 24th, 2013 at 3:38 pm. Both comments and pings are currently closed.